The hotel is located in two originaly gothic buildings forming a part of fortification wall of the royal town of České Budějovice. The city wall protected on this spot one of the most important gates into town – the Prague gate what was pulled down in 19th century and what stood next to our hotel. town was left in ruins. During the reconstruction we found a late gothic fresco hidden underneath shifts of plaster. To our stonishement we realised that it presents The Babtism of our Lord in a form of one of the best preserved frescos in town of that time. 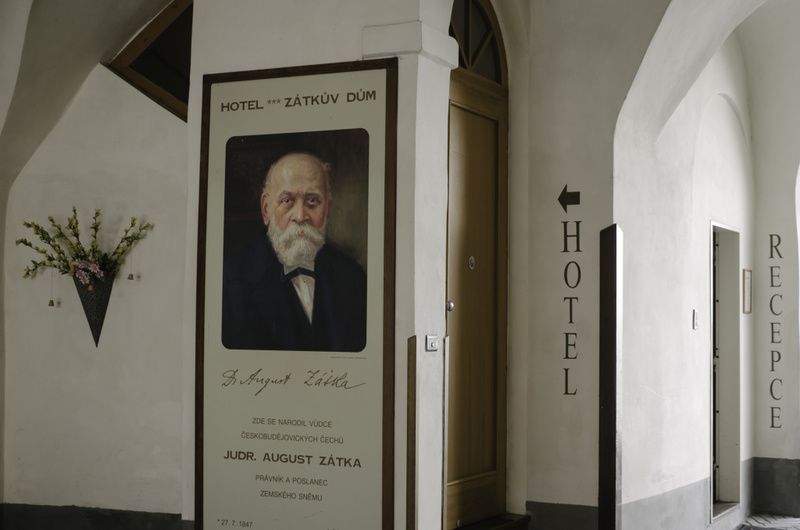 Our place bears the name of Mr. August Zátka, a well known business man, politician and patriot of České Budějovice who was born here in 1847. His statue overlooks the courtyeards of the city hall and his bust welcomes you at the hotel entrance. 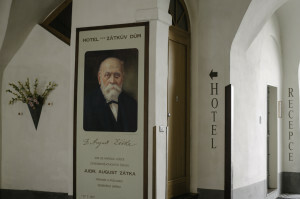 His importance for the whole region of South Bohemia in the past and at present obliges the hotel owners to maintain his tradition in the best shape.